I originally qualified in Psychology from Wolverhampton University in 1997, but I'd always had an keen interest in Osteopathy after being treated by an Osteopath as a young teenager following the acute onset of Osgood Schlatters Disease (a debilitating knee problem). As such I decided to pursue a career in Osteopathy, and I graduated from Oxford Brookes University in 2003. I have been registered with the General Osteopathic Council ever since. My time is spent between private practices in Northfield and Burntwood, and I also work as an Occupational Osteopath with Carl Zeiss Vision. I have additional qualifications in both Acupuncture and Electro-Acupuncture, and I have completed training in Emergency First aid, Myo-fascial massage and advanced Ergonomics. I also have a Post-Graduate Diploma in Animal Osteopathy, and I'm spending time in various local stables and yards treating horses, and visiting current patients at home to treat their dogs. I regularly keep up-to date with current Osteopathic thinking by attending a variety of courses around the UK, fulfilling my Professional Development requirements as stipulated by the regulator. 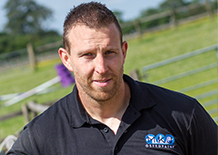 I have extensive experience in treating sportsmen and women of all levels and ages, from amateur footballers and semi-professional athletes, to professional power-lifters, body-builders and international kick-boxers. Professionally, my main interests are centred around Arthritis and its associated pain and problems, Occupational / Ergonomic / Postural issues, and Sports Injuries.